Attleboro, 62 @ Stoughton, 64 – Final – Stoughton senior Brandon Teixeira hit his fifth three pointer of the game with 13 seconds left to put the Black Knights ahead. Teixeira finished with a game-high 27 points and eight rebounds. Sophomore Cam Andrews added 15 points and three steals and Cam Gomes had nine points and five rebounds. Attleboro’s Jake Dunkley had 20 points and 11 rebounds, Lucas Boucicaut had 15 points on over 71% shooting and Andrew Miliken added 12 points and eight rebounds. Mansfield, 72 @ Canton, 47 – Final – Matt Ehrlich scored a team-high 21 points and Phil Vigeant added in 13 points and four assists for the Hornets. Sam Goldberg chipped in with eight points, five rebounds and four assists. Canton’s Woanyen Mahn had a team-high 10 points. Franklin, 50 @ Oliver Ames, 48 – Final – Kevin Gill scored a turnaround jumper in the paint off an assist from Sam Harrell with just 0.8 seconds left as Franklin completed a big second half comeback. After being down as much as 14, the Panthers rallied for a big third and fourth quarters. Tim Prunier had a team-high 14 points for Franklin. Tim Kelley had a game-high 15 points for Oliver Ames and Dylan Mahoney added 10. King Philip, 63 @ Milford, 66 – Final – Milford’s Dwight Anderson recorded a double-double with a game-high 15 points and 10 rebounds while Dee Torres added 15 points and Nate Davila had eight points. King Philip freshman Kyle Layman also had a double-double with 20 points and 25 rebounds. North Attleboro, 55 @ Sharon, 69 – Final – Ricardo Ripley was the top scorer for the Eagles with 18 points while Matt Lowerre hit three three pointers and finished with 11 points. Mitchell Sirota and Adam Banks had strong games and combined for 23 points. Brent Doherty led North Attleboro with a game-high 21 points. Canton, 24 @ Mansfield, 49 – Final – Caroline Maher led the way for the Hornets, who led 43-14 going into the fourth, with 13 points. Jackie Carchedi had a solid overall game for Mansfield with seven points, six rebounds, and seven steals. Foxboro, 68 @ Taunton, 36 – Final – Ashley Sampson led the way for the Warriors with 25 points. Cassidy Harrison added 11 and Carolyn Will had 10 for Foxboro. Oliver Ames, 58 @ Franklin, 47 – Final – Kayla Raymond had a double-double for the Tigers with 15 points and 10 rebounds and Niyera Mitchell added 14 points to pace the Tigers, who outscored Franklin 24-10 in the fourth quarter after trailing by six with four minutes to go. Francesca Calabraro added 10 points and Sam Bamford has six of OA’s 12 steals. Franklin was led by Lauren Rudolph with 10 points and Aubrie Kutil and Margaux Welsh each had seven. Milford, 41 @ King Philip, 37 – Final – Kate Irwin led the Hawks with 18 points and Jill Power added nine points for Milford. Sharon, 44 @ North Attleboro, 57 – Final – The Rocketeers were led by Caroline Collard with 13 points. Ashley Ahern added 11 points and six assists, while Emily Schromm had 10 for North. Sharon was led by Alyssa Piazza with a game-high 18 points and 10 rebounds and 13 points from Charlotte Ransom. Stoughton, 58 @ Attleboro, 49 – Final – Jess Greer led Stoughton with 14 points and sophomore Val Whalen chipped in with 10 points and 10 rebounds. Four different players scored in double figures for the Black Knights. Attleboro, 3 vs. Littleton/Bromfield, 2 – Final (2 OT) – Attleboro won the game on a goal by P.J. Elliott on the first shift of four on four play in the second overtime for the Bombardiers who advance to the tournament’s championship game. Elliott also had the tying goal in the third period. Jack Flynn scored Attleboro’s first goal on the power play. The game counts as a 2-2 draw in terms of tournament qualification. 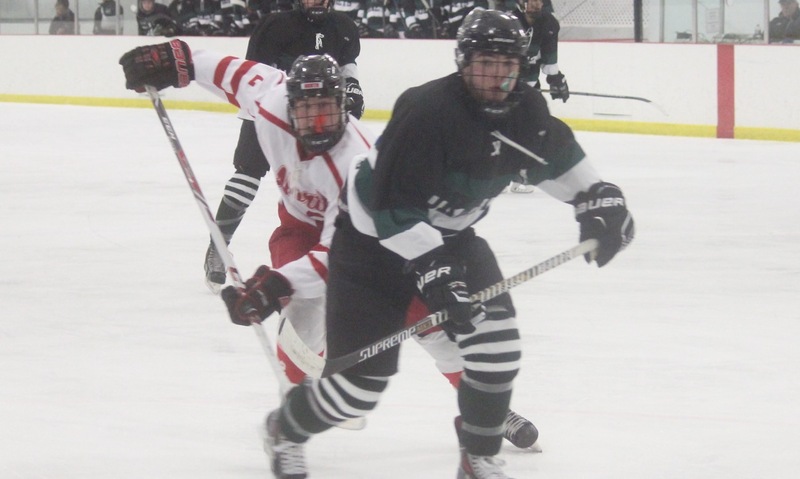 Taunton, 6 vs. Durfee, 1 – Final – Zack Albert and Jordan Hoey scored a pair of goals while Jake Roberts added one and Jack Patneaude scored his first career goal. Mike Volkmann had three assists and Cam Pitts made 14 saves in net for the win.